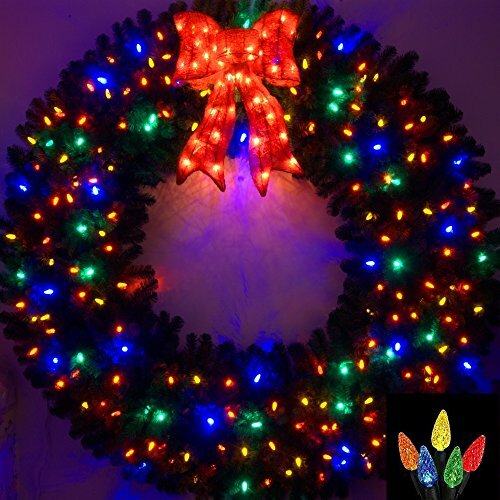 6 Foot (72 inch) Multi-Color L.E.D. Christmas Wreath is shipped in 4 pcs (2 boxes) and will require easy assembly upon receipt (bolts & wingnuts, included). Size 72" x 72" - Large Prelit Bow! 200 Multi-Color L.E.D. Lights - LARGE C6 BULBS! Long Life: Up To 25,000 Hour Bulb Life - Plugs directly into outlet! Commercial Grade: Heavy Duty/Light Weight : App. 27 Lbs. If you have any questions about this product by Artificial Christmas Wreaths, contact us by completing and submitting the form below. If you are looking for a specif part number, please include it with your message. Allstate Life-Size Regal Peacock Pretty in Pink Bird with Closed Tail Feathers, 60"